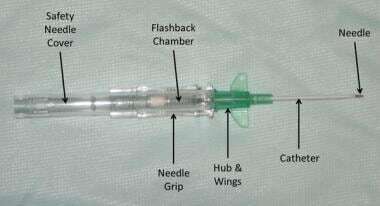 This topic describes placement of an over-the-needle IV catheter, in which the catheter is mounted on the needle (see the first image below). Such devices are available in various gauges (16-24 gauge), lengths (25-44 mm), compositions, and designs (see the second image below). In general, it is advisable to select the smallest gauge of catheter that can still be effectively used to deliver the prescribed therapy; this will minimize the risk of damage to the vessel intima and ensure adequate blood flow around the catheter, which reduces the risk of phlebitis. However, if the situation is an emergency or if the patient is expected to require large volumes infused over a short period of time, the largest-gauge and shortest catheter that is likely to fit the chosen vein should be used. The superficial veins of the upper extremities are preferred to those of the lower extremities for peripheral venous access because cannulation of upper-extremity veins interferes less with patient mobility and poses a lower risk for phlebitis. It is easier to insert a venous catheter where two tributaries merge into a Y-shaped form. It is recommended to choose a straight portion of a vein to minimize the chance of hitting valves. This article describes the placement of an IV catheter in an upper extremity. 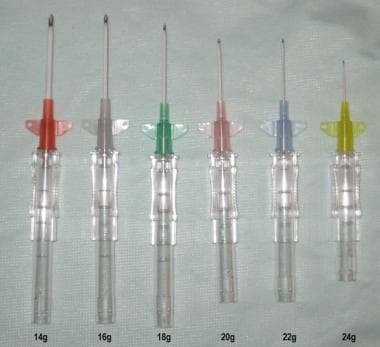 A similar technique can be used for placement of IV catheters in different anatomic sites. No absolute contraindications for IV cannulation exist. Some vesicant and irritant solutions (pH < 5, pH >9, or osmolarity >600 mOsm/L) can cause blistering and tissue necrosis if they leak into the tissue, including sclerosing solutions, some chemotherapeutic agents, and vasopressors. These solutions are more safely infused into a central vein. They should only be given through a peripheral vein in emergency situations or when a central venous access is not readily available. Ortega R, Sekhar P, Song M, Hansen CJ, Peterson L. Videos in clinical medicine. Peripheral intravenous cannulation. N Engl J Med. 2008 Nov 20. 359(21):e26. [Medline]. Stein JI. A new technique for obtaining large-bore peripheral intravenous access. Anesthesiology. 2005 Sep. 103(3):670. [Medline]. Fields JM, Piela NE, Au AK, Ku BS. Risk factors associated with difficult venous access in adult ED patients. Am J Emerg Med. 2014 Oct. 32(10):1179-82. [Medline]. Rickard CM, Webster J, Wallis MC, Marsh N, McGrail MR, French V, et al. Routine versus clinically indicated replacement of peripheral intravenous catheters: a randomised controlled equivalence trial. Lancet. 2012 Sep 22. 380(9847):1066-74. [Medline]. Webster J, Osborne S, Rickard CM, New K. Clinically-indicated replacement versus routine replacement of peripheral venous catheters. Cochrane Database Syst Rev. 2013 Apr 30. 4:CD007798. [Medline]. Partial selection of equipment required for IV cannulation. Vacuum collection tubes and adaptor for IV cannulation. Vein palpation for IV cannulation. Insertion sites for IV cannulation. Insertion site for IV cannulation. Application of antiseptic solution for IV cannulation. Flushing of tubing with normal saline for IV cannulation. Subcutaneous injection of local anesthetic for IV cannulation. Applying traction with nondominant thumb to stabilize vein for IV cannulation. Angle of insertion with bevel up for IV cannulation. Flashback of blood into venous access device for IV cannulation. Sliding hub of catheter over needle and into vein for IV cannulation. Using nondominant hand to secure venous access device in vein while using dominant hand to remove and secure needle for IV cannulation. Using blood sampling adapter for IV cannulation. Securing saline lock with transparent dressing for IV cannulation. Flushing and locking venous access device for IV cannulation. In same patient, flushing and locking venous access device for IV cannulation. Again in same patient, flushing and locking venous access device for IV cannulation. IV cannulation. Video courtesy of Gil Z Shlamovitz, MD. The author thanks Mark Scalzi, RN, BSN, for his help with producing the multimedia content associated with this article.